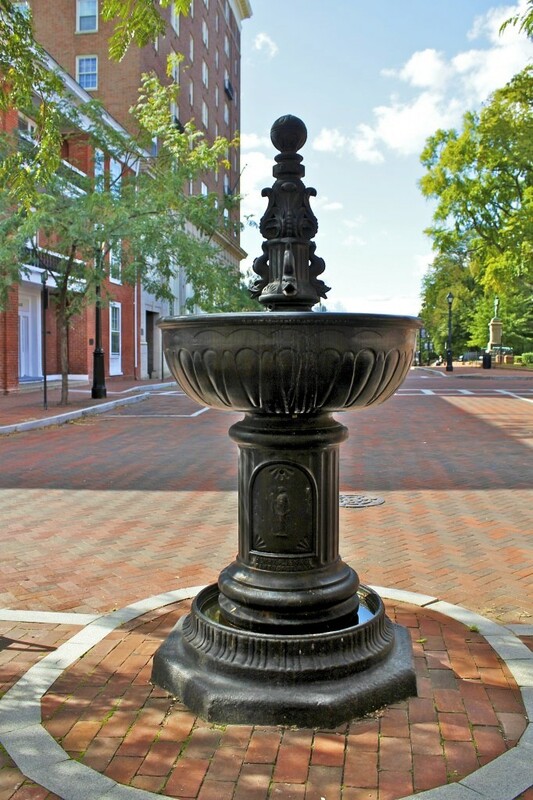 During the late 19th century, the City of Charlottesville erected four drinking fountains in the downtown area. 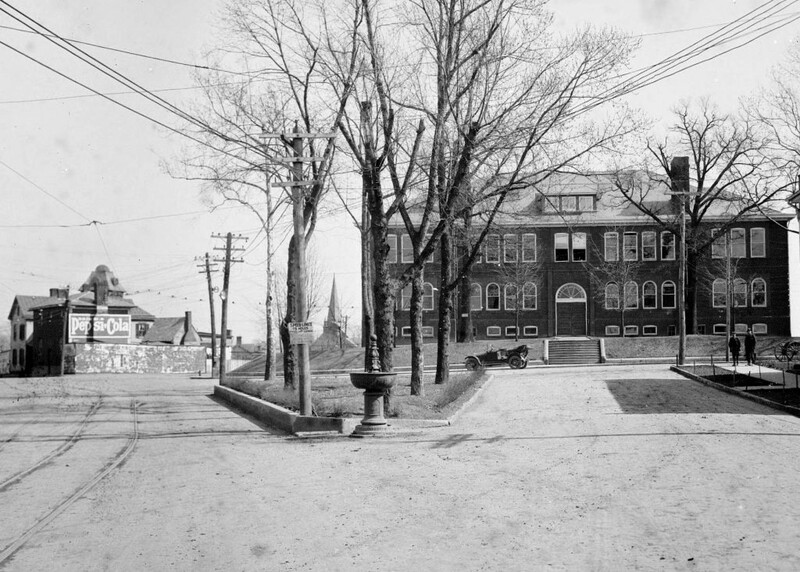 One of the fountains was located at the Midway School and was still in existence in 1917 (the Lewis & Clark monument now stands in this location). 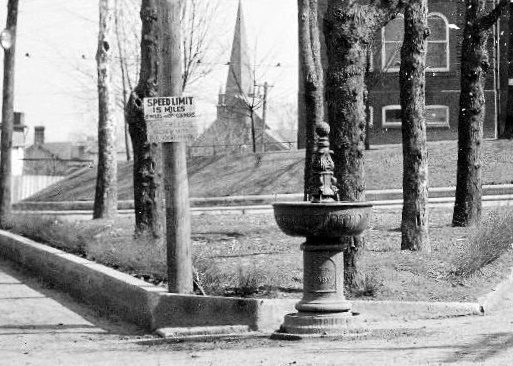 Another drinking fountain which stood outside the Courthouse on Jefferson Street was removed when the Monticello Hotel was built in 1926. 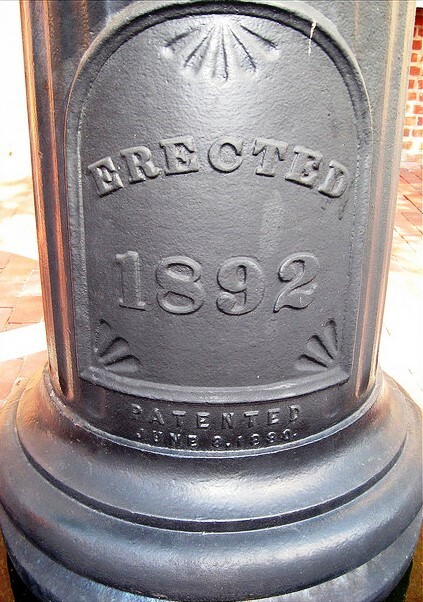 It was restored and installed outside the Courthouse in 2004. A marker placed in paving stones on the ground relates the history of the fountains. 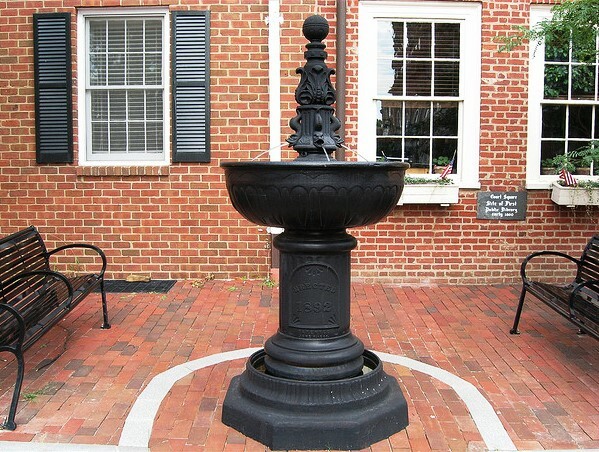 During the late 1800’s, the City of Charlottesville installed four watering fountains in the downtown area. 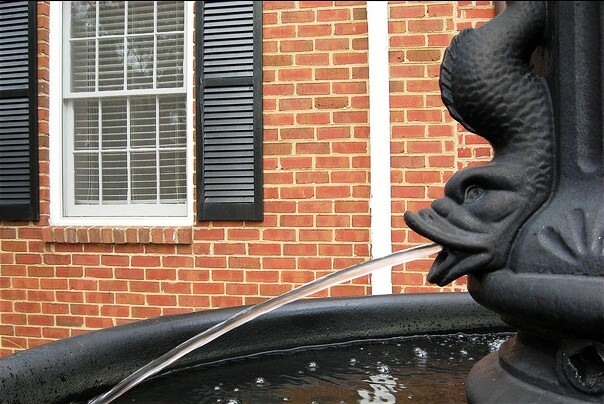 The fountains were designed to provide water to the citizens, their horses and other domesticated animals. Water was provided by the City water system and fed through four fish-like features to the upper bowl. The overflow then filled the lower trough for smaller animals. 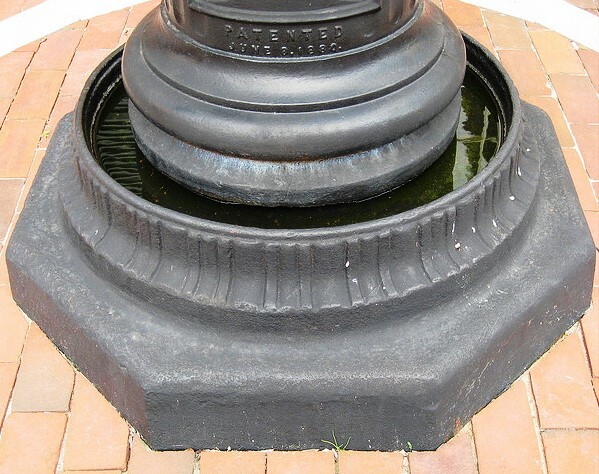 A fountain similar to this one once stood in front of the courthouse on Jefferson Street and was removed at the time the Monticello hotel was built in 1926. 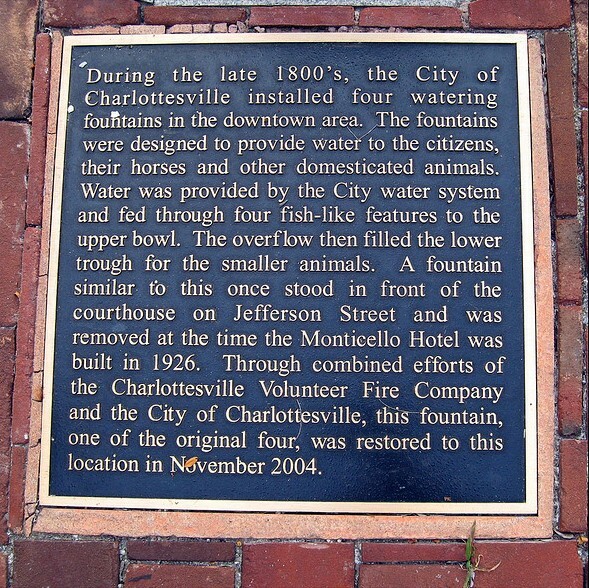 Through combined efforts of the Charlottesville Volunteer Fire Company and the City of Charlottesville, this fountain, one of the original four, was restored to this location in November 2004. The structure stands on an octagonal plinth. A fluted circular moulding creates a trough at ground level for the use of dogs. The fluted pedestal with attic base rising from the center of the trough hosts an arched panel containing a dedication, Erected 1892 and the legend, Patented / June 8, 1880. A second panel contains the image of a woman in bas-relief. She is dressed in classical robes raising a cup/bowl in her right hand and a pitcher in her left hand. 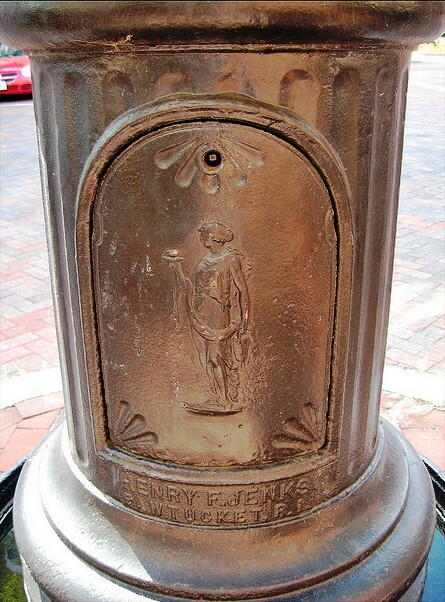 The manufacturer’s name is visible, Henry F. Jenks / Pawtucket, R.I. The capital which supports a large basin 56 inches in diameter, and capable of holding 100 gallons, is decorated with bas-relief fret. It is 4 feet 3 inches above ground level and was originally used by horses. A central jamb of 4 dolphins spouts water into the basin with the overflow falling to the trough below. 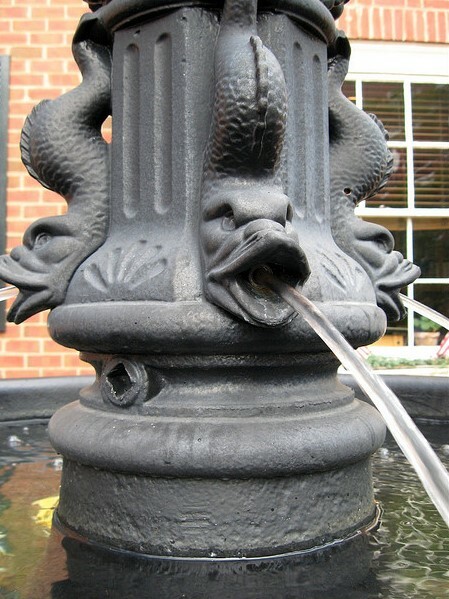 The pipes within the fountain were constructed to resist freezing in cold temperatures. 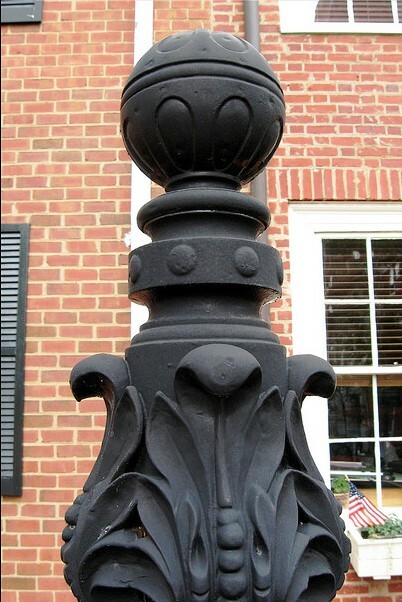 The finial is highly decorated with floriated relief and a studded band terminating in a globe with the same detail as the basin. 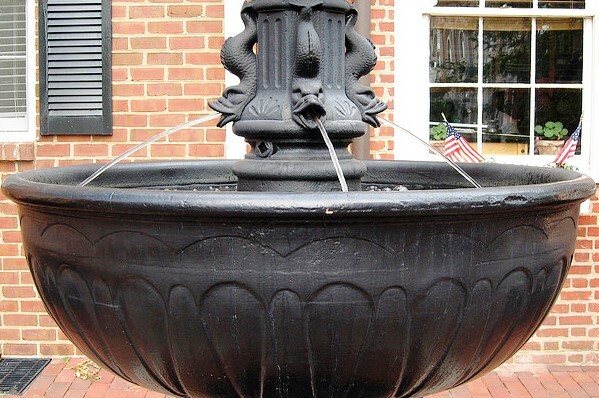 This entry was posted on Wednesday, April 29th, 2015 at 8:59 pm	and tagged with Charlottesville, Charlottesville Volunteer Fire Company, Courthouse, Henry F. Jenks, Jefferson Street, Midway School, Monticello Hotel, Pawtucket, R.I., Virginia and posted in Architecture, Cast Iron, Henry F. Jenks, Trough, United States of America. You can follow any responses to this entry through the RSS 2.0 feed.